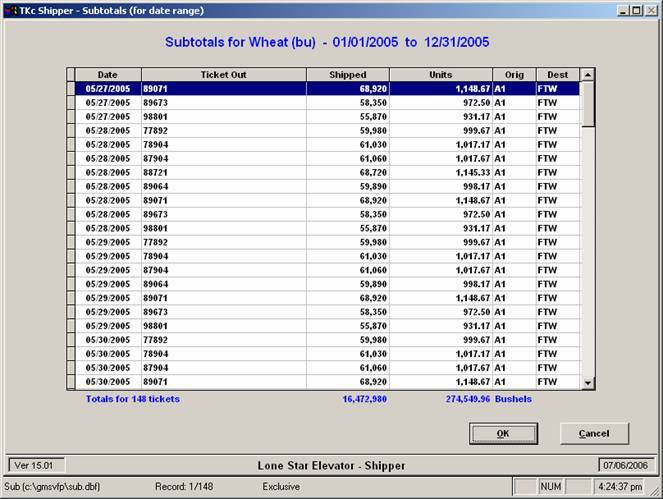 Our ELEVATOR GMS software service covers the full spectrum of elevator activities from receiving grain at the scale to shipping it to a terminal. 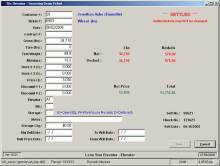 We help you keep up with each ticket from the time it is entered until it is settled and the producer receives a check. 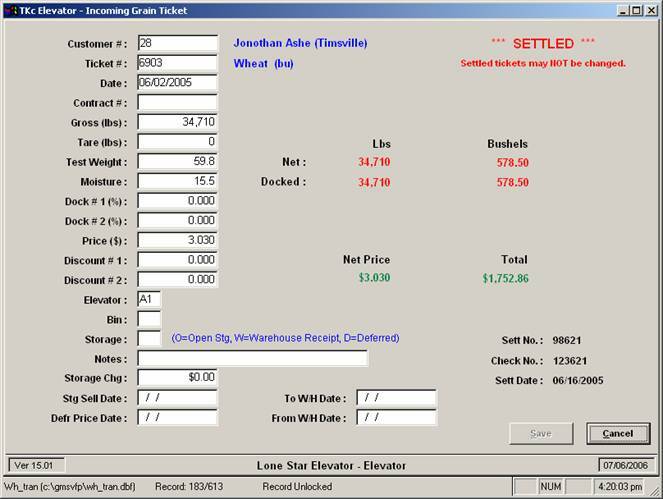 The customer settlement we produce is simple to understand and shows summary and detail information for all of the tickets that a customer is settling. 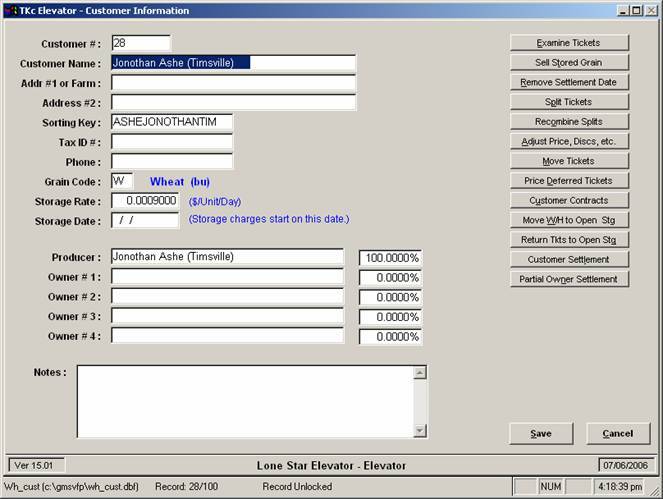 On the outbound side, ELEVATOR GMS allows you to easily see just what was shipped to selected destinations, who was responsible for the hauling, and any docks and discounts that were taken by the terminal. 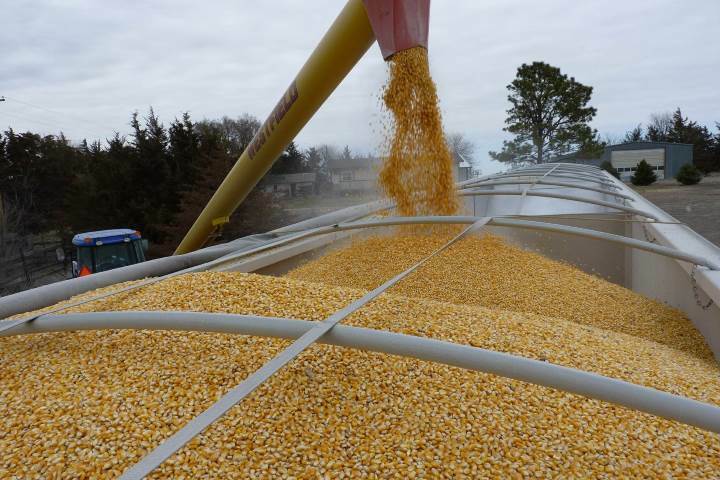 The inventory module allows you to see exactly how much of any grain is at your site at any given point in time and provides the details of whether the grain is on open storage, deferred pricing, or owned by the elevator. A daily position report may be produced for any time period for your personal use or for any inspection entity that might be visiting your facility. 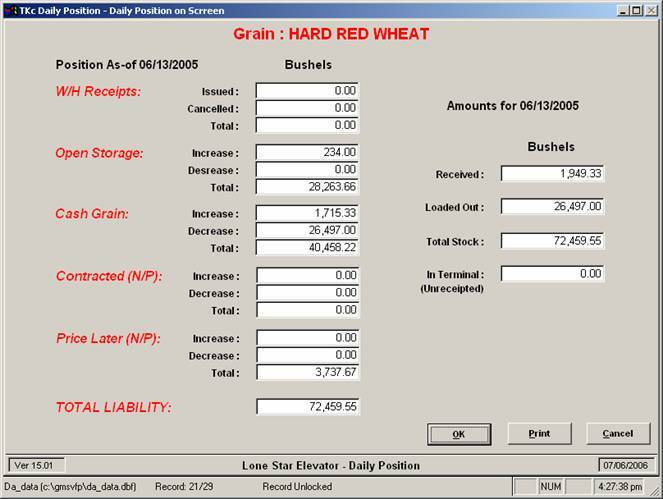 Our ELEVATOR Grain Management System will allow you to move away from manually tracking your grain elevator inventories with unwieldy spreadsheets and move to a reliable software solution that will increase the productivity and efficiency of your operation and the satisfaction of your customers. The first module is called ELEVATOR and is where incoming grain is processed. 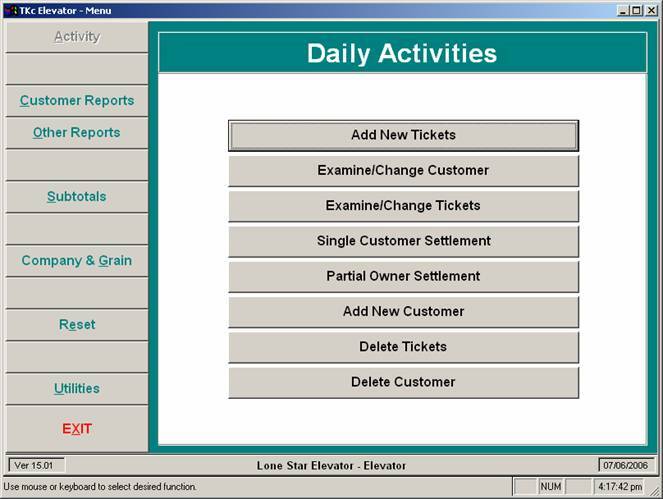 This is the area where you enter customer information and incoming scale tickets, produce settlements, print incoming grain reports, sell stored grain, and all of the other functions associated with incoming grain. 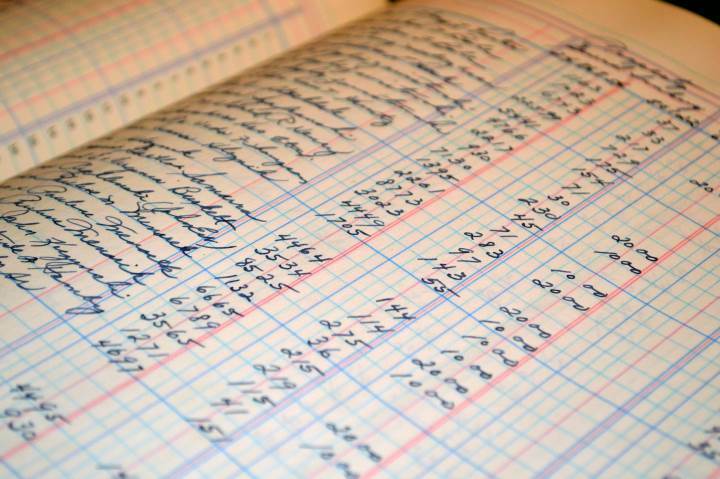 Customer information, including customer names, addresses, farm information and contracts, are maintained here. 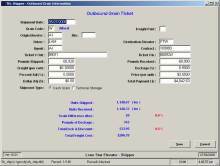 Customer settlements as well as numerous other reports are also produced by this component. 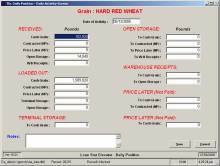 If you need to know how much grain was received during the last week, you can obtain that information with a few keystrokes. 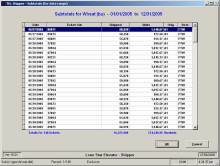 SHIPPER is the second major area of the system and is used to enter and maintain information about grain that is leaving your facility. 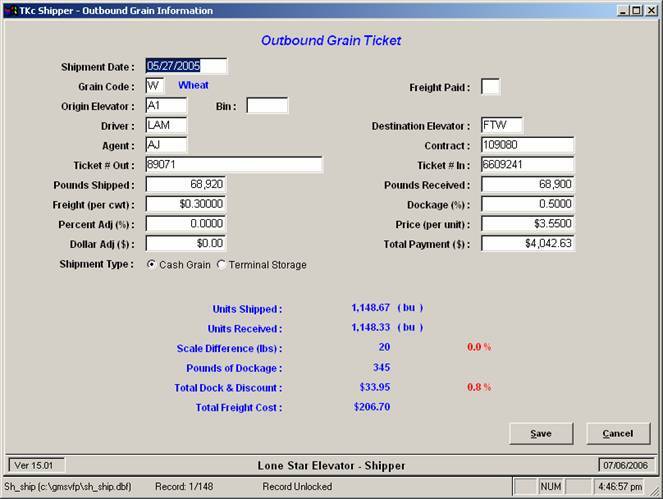 It can provide you with information about grain destinations, shipping agents, freight costs associated with the transport, and many other types of data. 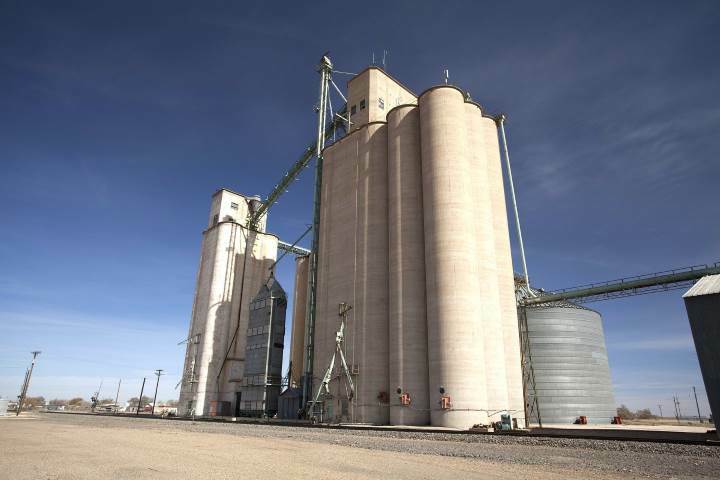 This component allows you to enter outbound tickets as they exit your facility and later enter the information that was supplied by the destination elevator where the grain was delivered. It is easy to see any discrepancies between what you say was shipped and what the other party says was received. This module also includes a number of other reports. 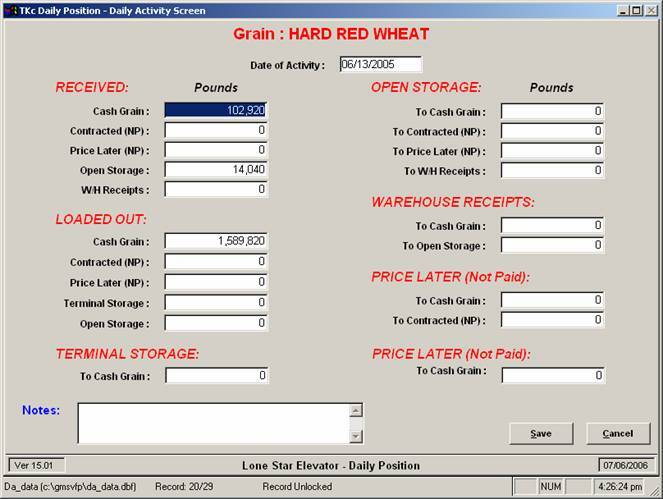 The final component of the system is known as DAILY and is where you keep up with the position of each of your grains. Information may be automatically transferred from the incoming (ELEVATOR) and outgoing (SHIPPER) tickets so that you do not need to re-enter this information a second time. You may also make manual adjustments to any position as are required. 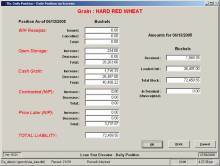 The main reports in this section are designed to show your position and liability information and are quite useful to the grain inspectors when they are reviewing your situation. 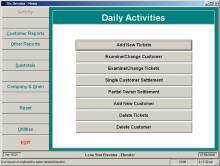 The system is menu-driven and designed for use by first-time computer users. Our system manual and training videos will get you up and running quickly. Other competitors require large up-front investments and significant ongoing support costs to use their products. We offer our service at an affordable, monthly subscription price with no long-term contracts or commitments. 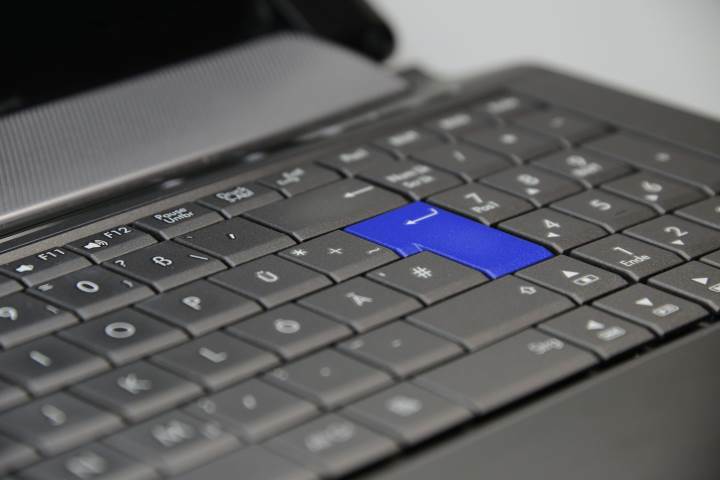 The data entry screens are designed to allow you to quickly enter data from the keyboard with minimal use of the mouse. The system is built to handle multiple users who are accessing the server from multiple locations concurrently. We've built our reputation by providing outstanding customer support and do our best to make sure that any question or problem is addressed promptly and with the same kind of personal service that we appreciate from others. The software service is cloud-based, freeing you from the hassles of installing software, dealing with network and server set up for multiple users, and planning for disaster recovery scenarios. Our servers and your data are located in a secure data center. 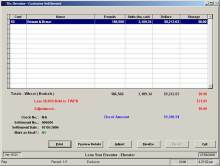 Access to the software is controlled with user login credentials. You can access the software service from any Windows computer with an Internet connection. This gives you the freedom to use the service from your office, your home, or from a laptop when you are on the road. Gone are the days of installing new releases and wondering if the software will run on your new computer. 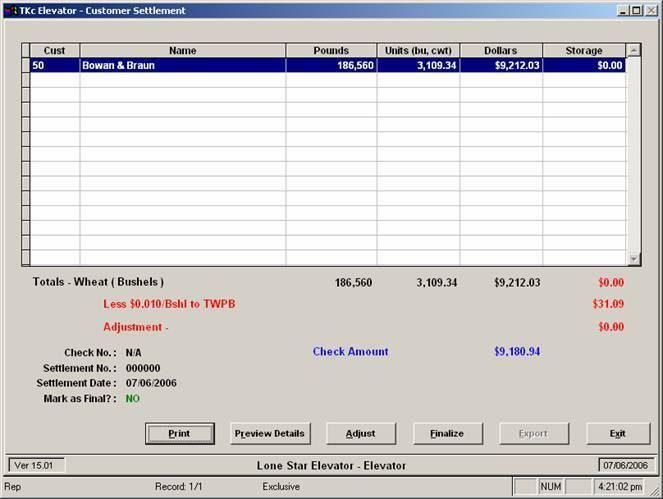 We handle all the software installations and updates, and you'll always be running the latest version of the software. Your data is safely protected from loss. A backup copy of your data is sent to an offsite location each day for safekeeping. 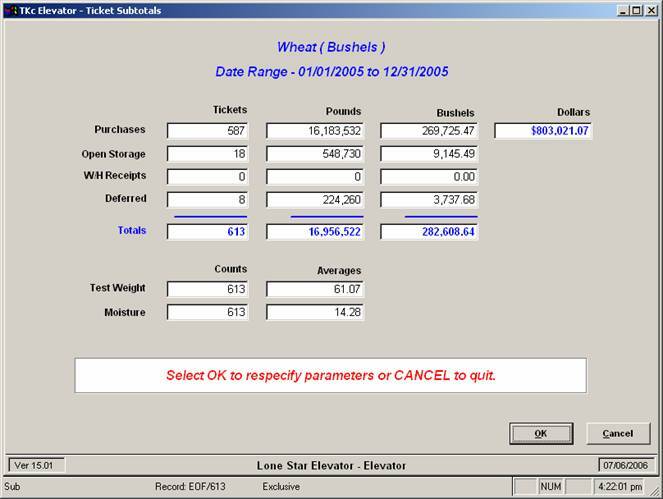 Our ELEVATOR Grain Management System is offered as a software subscription and is hosted on servers in the cloud. Our servers are maintained in a secure data center and are accessible from a desktop computer with a web browser in any location with an Internet connection. The subscription requires an initial one-time setup fee and an economical monthly subscription fee based on the size of your elevator and the number of concurrent users of the service that you require. Pricing begins at $100/month for a subscription with up to three (3) concurrent users. The setup fee for this configuration is $250. We offer a 15-day free trial period for you to fully evaluate the service and its applicability to your business. The trial includes sample data, a detailed instruction manual, and a link to our online training videos that we have created to help new users in the evaluation process. If, during your 15-day trial period, you decide to subscribe to the software service, simply notify our office and we will set up and activate your subscription and begin billing you for the setup and subscription. If we have not heard back from you by the end of the 15-day trial, your trial will be discontinued automatically.